If someone asks me what are my fondest memories with mom, I’d remember standing beside her and helping her out to make this delicious indian sweet “Mysore Pak”. I always heard people thinking this is the hardest recipe to fix at home but trust me, a little patience is what you need to make this dish. I happened to have a couple of disasters in my kitchen before I learnt to make it the right way. So do not give up, if you fail to do so the first time. If your mysore pak is yellow on top and the middle layer looks light golden brown in color it means you have successfully made this dish. Many a times I ended up my mysore pak looking yellow in color all the way inside and out but finally got to do it after many attempts in the kitchen and I’m happy to share the recipe with my dear readers now. Pardon me for not adding detailed pictures. With both my hands occupied in making the dish and hubby dear not around, I ended up taking the final outcome of this dessert. But I promise to update the post with a few more pics asap. This is also my entry for mithai mela hosted by dear srivalli of cooking 4 all seasons. Here we go on a quick tour. slotted spoon to pour in the ghee & oil mixture while cooking. Heat 5 tbsps of peanut oil to smoking point and pour this in besan. As soon as you pour the oil in, it makes a sizzling sound. Mix the besan gently (be careful, the oil is hot. Use a wide spoon to mix, if required) so that the oil coats well and the mixture resembles crumbs. Sieve this mixture and set aside. This process helps to avoid lumps while mixing with sugar syrup. Heat 1 cup of melted ghee and ½ cup of peanut oil together to smoking point, reduce the flame to low and leave it. We will be using this later after adding besan to the sugar syrup. So ideally you will have two burners, the left one with hot melted ghee on low setting and the right one for cooking sugar syrup and besan mixture. Now reduce the flame to the lowest setting and slowly add in the sieved besan flour to the sugar syrup while mixing with your right hand. Take the help of your friend if you cannot do both simultaneously. When the besan is well mixed with the sugar syrup and no lumps are seen,using a slotted spoon start pouring in the heated oil and ghee mixture with your left hand while stirring the besan and sugar syrup mixture with your right hand. The ghee & oil should be poured at intervals. An easy way to do this is, as you pour in the first spoon of ghee and oil in the besan mixture it makes a sizzling noise, showing holes in the mixture and absorbs all the ghee. Then pour in the next spoon of ghee & oil and follow the same steps. By the time you are finished adding all the ghee & oil, the besan starts leaving sides of the vessel and showing a frothy mixture with lots of holes. At this point immediately remove the mixture and pour it in the prepared greased tray. Do not press or adjust the top layer to form a smooth surface. Leave it to cool for about 10 minutes, cut into desired shapes, allow it to cool completely after making cuts and serve. Make sure all the ingredients used are fresh and no cut backs on the quantity of ghee & oil mentioned in the recipe. Make sure you grease the tray with ghee and set it aside, ready to pour in the cooked mixture into it. You do not want to do this in the last minute because the mixture gets burnt in a blink of eye if you turn away even for a minute. Never attempt to make this dish on a high flame. One String means when you stretch the syrup between the thumb and index finger it forms a thin string. Alternatively you can put a drop of the syrup in a small cup of water. If the syrup does’nt dissolve in water, reaches to the bottom and forms a ball it means the syrup is ready. At any point of time do not stop stirring the mixture when you start adding the ghee & oil to besan – sugar syrup mixture. Very tempting and I will try this recipe. Can we use Canola oil instead of peanut oil, or is it strictly peanut oil? I made your delcious Peanut chutney too and posted it at FH.Thanks for that recipe. wow soujanya . it looks delicious .. I love this sweet from childhood .. thanks for the post ……. I recommend peanut oil for this recipe.Thanks for the nice words. Let me know if you need any help. I’d be more than happy to help you. wondering how you get time to manage your blog, try others recipes, and lot other things 🙂 I envy you. Thanks for trying the recipe. Wow am drooling over mysore pak..looks gorgeous! oh yeah thats absolutely for you srivalli 🙂 Lemme know how you liked it. Excellent colour and texture……especially madhyalo brown colour……….I always wondered how halwais get that right……..adaragottesaaru soujanya….Thank you very much. HEhehe….mallee nene….first aa picture choosi immediately comment chesi leisure gaa post chadivaa… D. Thanks for the detailed recipe. So, the secret lies in peanut oil kadaa…. !.Slotted spoon ante..? chatramaaa…? sahiti, peanut oil gives nice flavor to dishes. slotted spoon is a deep spoon to hold ghee, like the one we use to serve pappu charu or sambhar. ante lothu garita anna maaata. let me know how u liked it and don’t hesitate to get in touch with me if u need any help. One of my favorite sweets and yours has come out so good! I like this hard textured one better than the soft ones..
hello Sowjanyagaru, I am kind of like you. I used to help my mom in cooking and i told her to make a note in the book so that it will help me when grow. But all the things are change. I tried my mysore pak many times. But still i am not getting the brown texture in the middle. I am going to try that today. I saw your blog just now and searching for some other recipe, my eyes suddenly saw this recipe. Let me try that and update you what happened. Nice to hear from you. I had to try many times infact to get that brown texture in the middle. Do let me know if you need any help. Thanks for dropping by. Hey – Your mysore pak sure looks good. But, I have not tried it with peanut oil. no middle brown layer and holes only on the top! CAn you please let me know what exactly I need to do and watch out for to make it look like the ones in the picture? Tasted great ,though! Why peanut oil? No just ghee? The brown layer in the middle comes by practice. The besan mixture should be removed right on time. Even I did not get this right for a long time believe me or not. So don’t get discouraged and keep trying. Next time I make this dish at home, I’ll try checking out the exact time it should be removed to achieve the brown color in the middle, so I can let you and my other readers know. i followed u’re instructions and the out come was great. 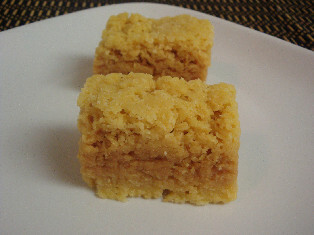 i could make the mysore pak i coudent believe my self. i looked exactly like the picture u have posted and tasted awasome.